Find your outdoor living style and learn how to design your ideal outdoor living space in Indiana. 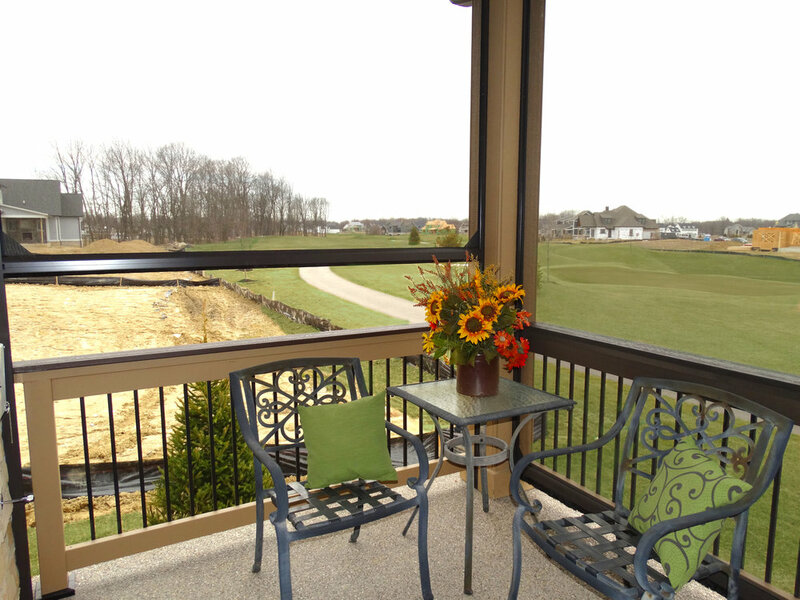 Outdoor living areas in Indiana have become essential in new construction homes. In recent years, outdoor living spaces are referred to as an extension of the indoor living space. We have outdoor areas for all types, all seasons and all lifestyles. Below are different outdoor living spaces and ways to incorporate them into your style. Decks – Decks are perfect for those who love being in the sun and close to the elements. Decks, the most common and popular outdoor living space, have some railing, depending on whether the deck is on the main floor or an upper level. Decks are a versatile option in outdoor living. They are able to be stained, painted or executed in a variety of styles to create different looks. New highlights with decks include retractable awnings for additional shade during the summer months. Covered Porches - Covered porches are a great option to allow the outdoor living space to be livable in most seasons. This will shield you from harsh elements throughout the year while maintaining a proximity to nature with one side fully open. Finish this space with a tv and fireplace for comfortable afternoons spent lounging. With the built in tv box, there is hardly a risk for the elements to damage the electronics. Three Seasons Room – Also referred to as a ‘Screened-in Porch’, this type of outdoor living allows you to be protected from the sun and bugs with the roof and screens, while maintaining a proximity to the outdoors. For those who would like to have the freedom of a covered porch but the bug-resistance of screens, there is always the option for retractable screens. Retractable screens can be controlled easily with a remote and take only seconds to transform this living space. Outdoor Kitchens – Outdoor kitchens can complete any back yard. Typical flooring is normally completed with stone, paved cement or brick, adjoining to a house or a deck. Finishing options include stamped or aggregate concrete. Outdoor kitchens offer ample space and creativity for entertaining. 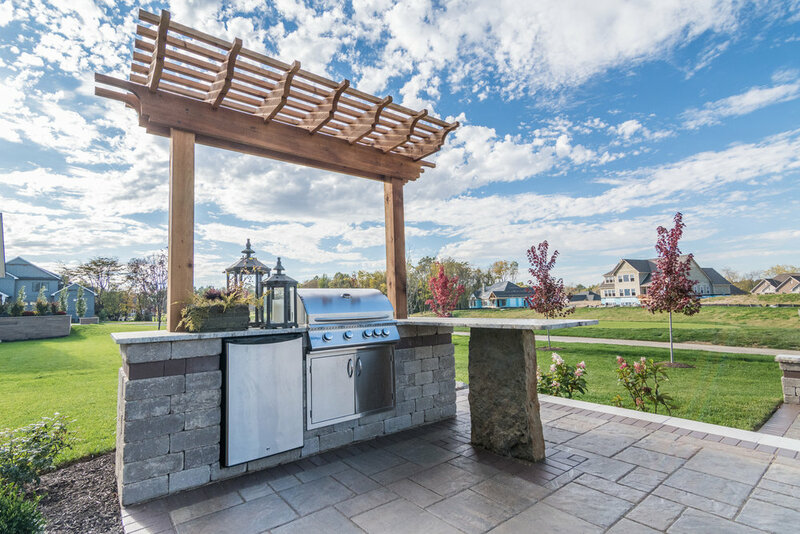 To create your perfect outdoor living kitchen, all you need is a grill and space for friends and family. Fire pits - Fire pits offer a new take on the traditional fireplaces/campfires from our past. New fire pits are often gas fires controlled with a switch or remote rather than lighting logs with a match. Introducing a fire pit into your outdoor living can create a warm atmosphere from friends and family to spend nights outdoors in. Pergolas – Pergolas offer limited shade and protection from the sun but are fun ways to differentiate or personalize an outdoor space. Decorate your space with plenty of seating, a set of stringed lights and a grill. This area is great for lazy summer evenings spent with friends. At Old Town Design Group, we are happy to consult with you each step of the way. Our in-house architecture team is eager to understand and incorporate your dreams, aesthetic style and lifestyle into your new custom home.